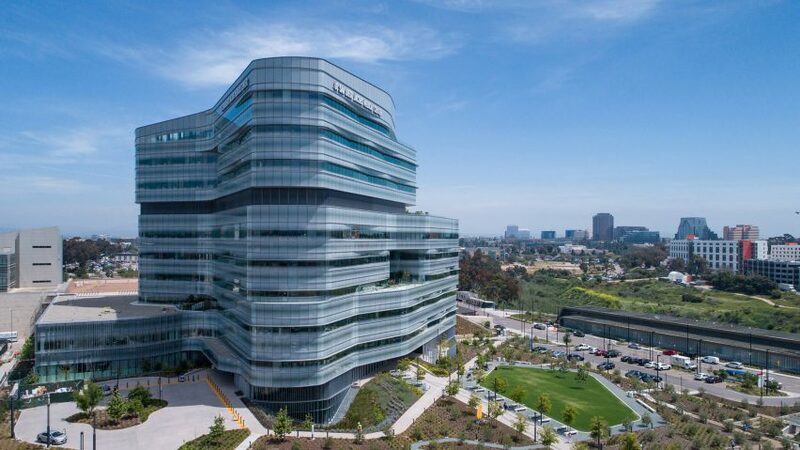 American firm Cannon Design has largely avoided right angles while designing this medical facility near San Diego, resulting in a building defined by curvilinear forms and surfaces. The Jacobs Medical Center is located on the University of California San Diego campus in the seaside town of La Jolla. The 245-bed hospital contains speciality centres for cancer care, advanced surgical care, and high-risk obstetrics and neonatal care. "The health centre blurs the boundaries between research and healthcare delivery while elevating patient care experiences through creative technology integration, access to nature and beautiful interior and exterior spaces," said Mehrdad Yazdani, design principal at Cannon Design, which in total has 19 offices in the US and abroad. The 10-storey building is composed of irregularly shaped floor plates that are arranged in a way that creates cantilevers and setbacks. 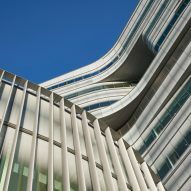 The building's curvilinear form was driven by the placement of patient units, according to the firm. 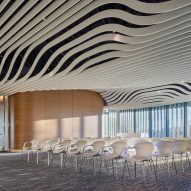 "The geometry creates a subtle continuous flowing curve of the exterior – a dynamic form that changes as one passes around the building's perimeter," the team said. Advanced computer modelling enabled to the team to minimise solar heat gain and glare while also bringing natural light into the facility. 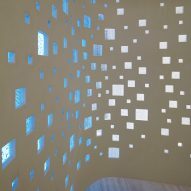 Fritted glass also helps reduce solar penetration. 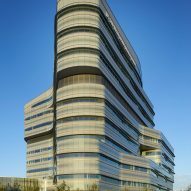 Encompassing 509,500 square feet (47,334 square metres), the hospital features a fluid layout and curved surfaces that mimic the exterior. 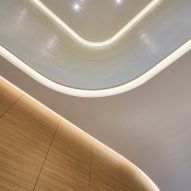 In certain public areas, such as the lobby and chapel, ceiling planes are carved away to form sinuous alcoves with lighting. In corridors, the team created curved corners, which enable patient beds to move more easily through the space. "The organic nature of the exterior translates to the interior to create an intentional and natural flow," the studio said. "As much as possible, right angles were avoided." Patient rooms feature contemporary finishes and decor, along with floor-to-ceiling windows that offer sweeping views of the surrounding landscape. 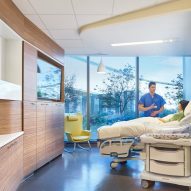 Behind each patient bed, a custom-designed headwall combines all necessary elements and equipment into a single sculptural element. "All patient rooms are also equipped with an iPad that can be operated from the bedside, empowering patients to customise their environments and securely view their treatment schedules and medical records," the team said. 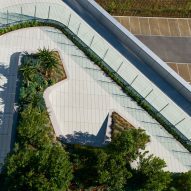 The facility has a number of gardens and terraces, which serve as quiet places of refuge for patients, visitors and staff. "The hospital combines the highest-quality advanced care with upscale amenities, architecturally significant design and future-focused technology – ushering in a new era in specialty inpatient care," the team said. Other health-related projects by Cannon Design include a massive urban hospital in Montreal, which covers two full city blocks, and a circular cancer centre in Los Angeles designed by the firm's offshoot, Yazdani Studio. Photography is by Christopher Barrett and Ethan Rohloff.